Aikido Founder, Morihei Ueshiba, is born on December 14th in the present-day city of Tanabe in Wakayama Prefecture. 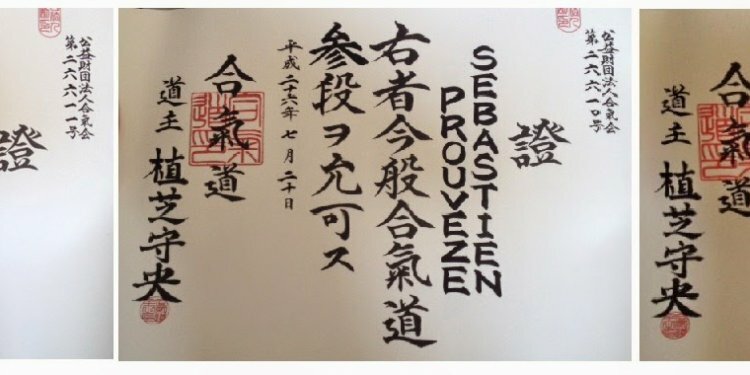 The Founder receives a license in Goto Ha-Yagyu Ryu Jujutsu from Mr. Masanosuke Tsuboi. The Founder applies for invitation from the government to become a pioneer to Hokkaido. Leads a group of pioneers in migrating to Shirataki (now known as Engaru-cho), Monbetsu-gun, Hokkaido Prefecture. The Founder meets Mr. Sokaku Takeda, the originator of Daito-ryu Jujutsu, at the Hisada Ryokan (inn) in Engaru, and asks for instruction. On his return home because of his father's critical condition, while in Ayabe (Kyoto Prefecture), the Founder makes the acquaintance of Mr. Onisaburo Deguchi, of the Omoto religious sect and devotes himself to ascetic spiritual training. The Founder's father, Mr. Yoroku Ueshiba passes away. The Founder opens a training dojo called "Ueshiba-juku" at the foot of Hongu, Ayabe. The Founder addresses "Aiki" as the essence of the Martial Arts, due to his development of the mind coupled with spiritual practices. The Founder comes to Tokyo with his family and begins teaching Martial Arts in Shirogane-Sarumachi, Shiba. His main activities move to Tokyo. The Kobukan Dojo is established in present-day Wakamatsu-cho, Shinjuku. The Kobukai Foundation, with Mr. Isamu Takeshita as its first president, is officially recognized by the Ministry of Health and Welfare of Japan. Plans to build an outdoor dojo in Iwama, Ibaraki Prefecture are created. The Founder starts to promote the development of Aikido in Japan and abroad. The Founder receives the Medal with Purple Ribbon of Honor from the Japanese Government. The Founder receives the award of the Order of the Rising Sun, Gold Rays with Rosette. The Founder passes away on April 26th at the age of 86. He receives the award of the Order of the Sacred Treasure, Gold Rays with Neck Ribbon, and the rank of Sho-Goi (fifth rank in the imperial court) posthumously.